By the early thirties, Raleigh’s X Frame was no longer the company’s prime seller. 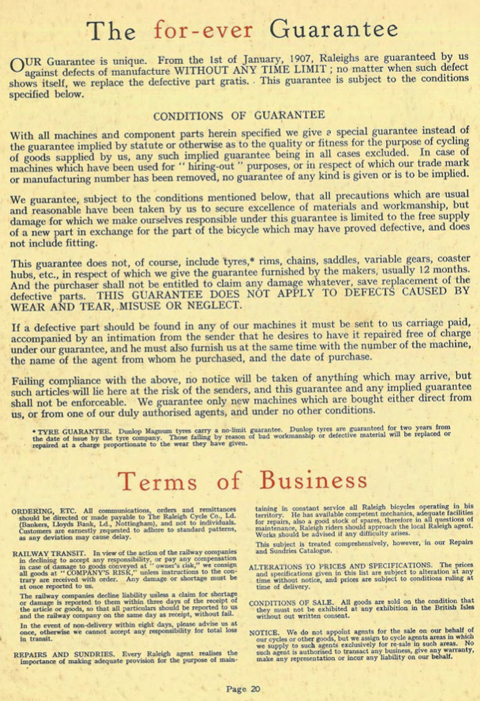 As a result of the poor economic climate of the early thirties, the company had to rationalise its production. So they introduced a new range of lightweight bicycles instead of the heavy duty roadsters they previously sold. Because the X Frame’s sturdiness was ideal for unmade Irish roads, a large batch was sent to Ireland for local assembly, and many were sold to the Irish Constabulary. 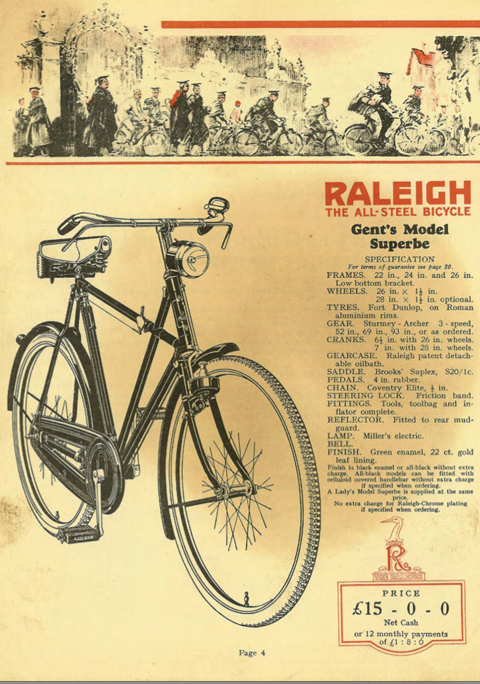 As a result, in their catalogues Raleigh renamed it the ‘Police Model’ and also the ‘Irish X Frame.’ It was advertised without chain case or gears at a reduced price. 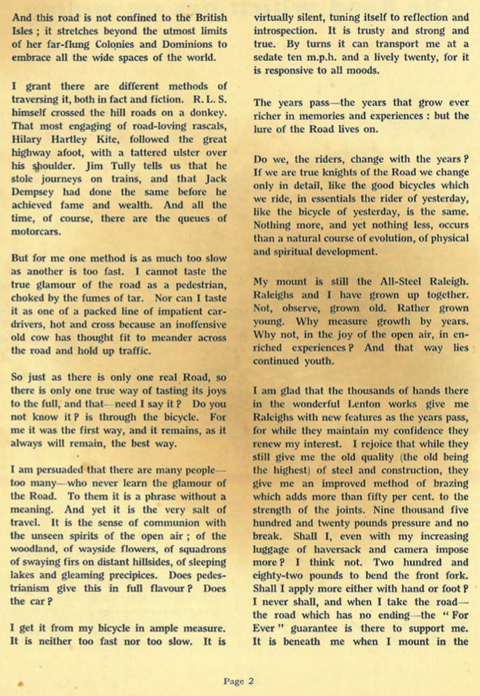 Although within a few years it was completely dropped from Raleigh catalogues, it was still available for special order, and was still in demand from customers in the Colonies. This unrestored example was dry-stored for several decades until I bought it recently from the daughter of its previous owner. I fitted new tyres and tubes this week. My inspection reveals mismatched pedals and the bottom of the rear mudguard is rusted (the remedy is to cut off the end). Otherwise the machine is in good original condition and after oiling and greasing as appropriate will be ready to ride. 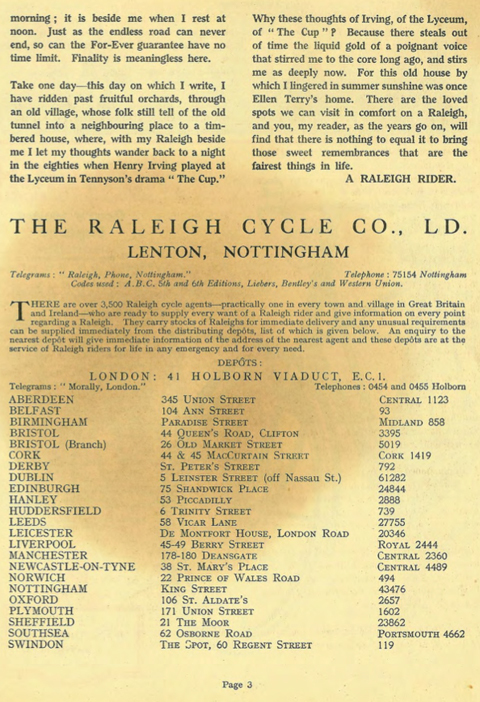 The ‘Model Superbe’ Crosss-Frame had been Raleigh’s top-of-the-line model since 1900 but, by the early 1930s, the company started to phase it out. As it still appeared under other guises for several years, I suspect that it was still available by special order. It was subsequently renamed the Police Model, as you can see below, and no longer given prime billing in the catalogue. 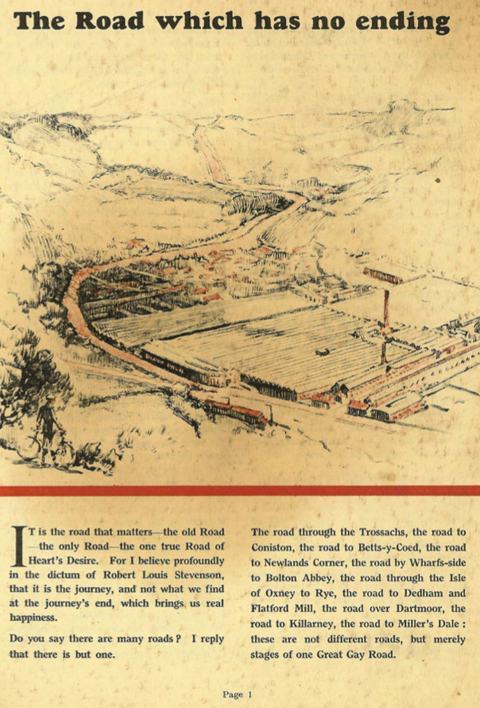 According to the book The Story of the Raleigh Cycle, the Irish government launched its ‘Industrial Programme’ in the thirties to encourage firms to employ local labour. 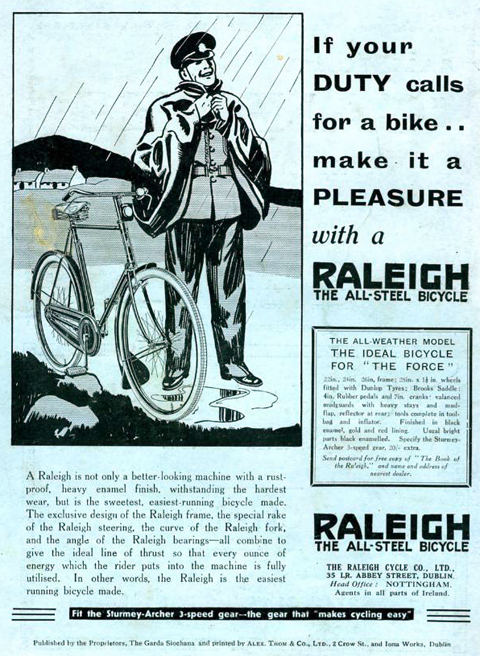 So Raleigh formed the Irish Raleigh Cycle Co Ltd in October, 1936, ‘though its factory was only really an assembly plant and did not actually manufacture bicycles. The factory became operational early in 1937 and an average of 1000 machines per week were put together there until the outbreak of the Second World War.’ This machine has a ‘J’ prefix to its frame number, suggesting manufacture around 1932. However, it’s possible that it was not built up right away, but remained unsold to be sent to Ireland with the other unassembled X frames. 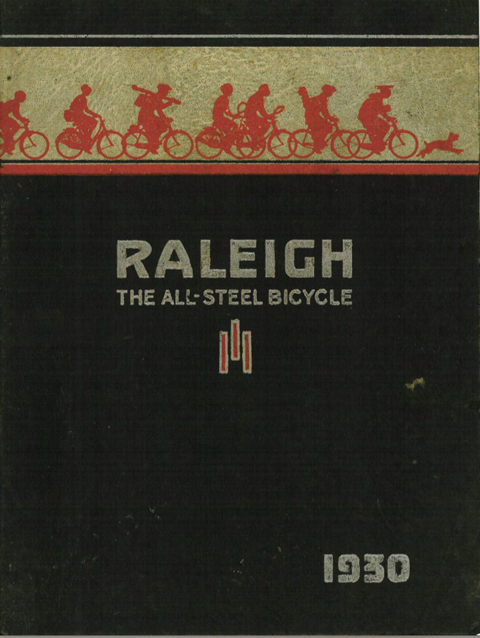 The 1930 Raleigh catalogue appears to be the last time that Raleigh calls its crossframe the Superbe, giving it prime position in the catalogue. By 1932 it was no longer the top-of-the-range model, but renamed the Irish Crossframe. So it would appear to have changed in 1931 or 1932. By 1935 it was not mentioned at all in the catalogue.